18 SEPTEMBER 20 - 26, 2017 WWW.UPANDCOMINGWEEKLY.COM OUTDOORS & RECREATION OUTDOORS & RECREATION Best Bowling Alley B&B Lanes 3003 Fort Bragg Rd. (910) 484-5179 or www.bandblanes.com STRIKE! B&B wins the title again. Open until almost midnight on weekdays and until 1 a.m. on weekends, B&B accom- modates bowling enthusiasts of all skill levels (and sleep patterns). With deals like Terrific Tuesdays' $1.59 games and Thirsty Thursdays' $8.88 all-you-can-bowl tickets, the alley accommodates a wide range of budgets, too. For celebrations, Fayetteville loves to take advantage of B&B's birthday pack- ages, which include games, drinks, food, balloon bouquets and more. B&B also has creative programs like children' bowling league that encourages children to make new friends while they learn to glide the shiny, marbled ball down the alley. There are also leagues for older adolescents and adults. On the second and fourth Tuesday of each month, bowlers of any skill level can enter a low-key tournament for the chance to win a small cash prize and big bragging rights. Bowling is a nostalgic, fun activity, and B&B gets everything right about creating the perfect atmosphere in which to enjoy it. Best Golf Course Gates Four Golf and Country Club 6775 Irongate Dr. (910) 425-6667 or www.gatesfour.com Why is Gates Four Golf and Country Club Fayetteville and Cumberland County's favorite golf course? Well, it's a recently renovated 18-hole champi- onship course. USGA-specified bent-grass greens provide a beautiful putting surface, and pine-tree-lined fairways create a peaceful atmosphere. Gates Four was the 2017 host for the 49th annual Cumberland County Golf Championship Classic held on Sept. 15. This prestigious tournament will celebrate its 50th Anniversary in 2018, and Gates Four will again have the honor of being its host. Gates Four PGA professional Scooter Buhrman and his staff help create the full-service, semi-private club golfing experience. From providing lessons to helping you organize your next fundraising tournament, they are ready to assist you in every aspect of the game. Buhrman and general manager Kevin Levertu make sure there's always some- thing fun going on at Gates Four. This year, events included themed dinners, couples golf, a Putts & Pints event in June and Family Golf Night in July. Gates Four also has an active Men's Golf Association. Members enjoy camara- derie and competition year-round. They plan five annual local golf tournaments and also compete in other golfing events and tournaments in and around the Fayetteville/Sandhills area. What puts the golfer experience over the top, however, are the amenities that come with the reasonably priced Gates Four membership. Members can transi- tion from a hard day's work on the green to a refreshing dip in a Junior Olympic- sized swimming pool and lounge with friends afterwards on the covered patio. The huge outdoor pavilion is perfect for weddings, reunions and other large gatherings. For indoor relaxation, the clubhouse offers conference facilities, a dining room and a full-service bar at JP's Grill. Tennis lessons are also available from certified tennis professional Derrick Berry. Best Fitness Coach Von Turks-Kling C.R.A.V.E. Fitness Studio: 4251 Legion Rd., Suite 115 (678) 907-0211 or bodybyvon@gmail.com When people use the word "life-changing" to describe your practice, you know you're doing something right. From Turks-Kling's Facebook page reviews: "Von is the absolute best! She pushes you past your comfort zone, she never gives up on you, and she knows her stuff!!" "Results are amazing!!! Life changing, excel- lent nutrition skills learned!" "Von has been a life changer emotionally and physically! Results enough said!" Turks-Kling was Women's View Magazine's cover girl in January 2017, and for reasons beyond her glowing reviews. She's not just a certified nutrition specialist, certified personal trainer and certified group fitness instructor. She also holds a B.S. in health science with a minor in biochemistry and physiology from Emory University. Her experience and educational background give her a deep understanding of the human body and health that many personal trainers, even those who are certified, do not have. She owns her own business, C.R.A.V.E. Fitness Studio, where she creates eat- ing plans, training programs and lifestyle suggestions specific to each client. In addition, she owns a food truck, Bowls on a Roll, that makes healthy eating easier for clients without cooking know-how or access to fresh ingredients. All in all, it's the way Turks-Kling cares about the people she works with and takes them seriously that won her Best Fitness Coach. 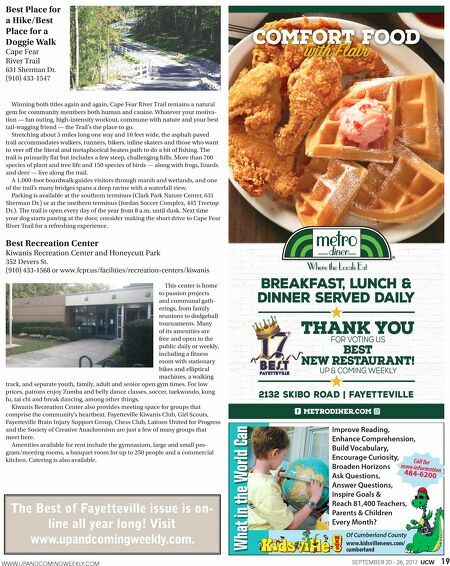 Best Picnic Area Arnette Park 2165 Wilmington Hwy. (910) 433-1547 A picnic is a great way to enjoy beautiful weather in the fall, spring and summer. Arnette Park offers the perfect setting. One-hundred acres of natural and developed land on the Cape Fear River com- prise Arnette Park. Over half its woodland is left untouched, making it fertile grounds for wildlife, plants and trees to flourish. Developed outdoor facilities allow for just about every activity under the sun. 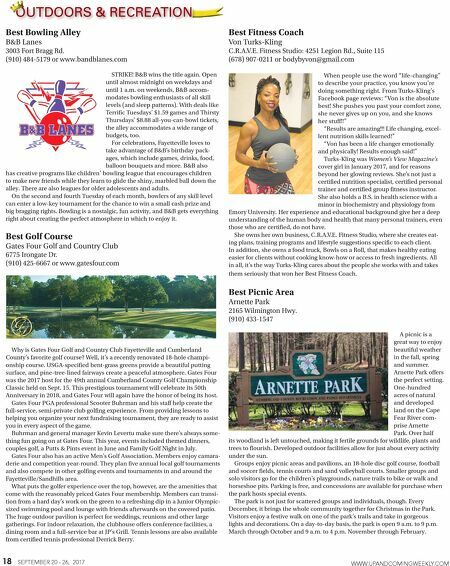 Groups enjoy picnic areas and pavilions, an 18-hole disc golf course, football and soccer fields, tennis courts and sand volleyball courts. Smaller groups and solo visitors go for the children's playgrounds, nature trails to bike or walk and horseshoe pits. Parking is free, and concessions are available for purchase when the park hosts special events. The park is not just for scattered groups and individuals, though. Every December, it brings the whole community together for Christmas in the Park. Visitors enjoy a festive walk on one of the park's trails and take in gorgeous lights and decorations. On a day-to-day basis, the park is open 9 a.m. to 9 p.m. March through October and 9 a.m. to 4 p.m. November through February.